Though lacking in power, the Energen Armor provides X with a formidable defense against enemies and spikes! The large crystal on the left arm acts as a Sub Tank, providing X with easy access to spare Life Energy. Its Buster Shot can pierce through walls but it doesn't travel very far. In short, this armor is perfect for players who may need a little help traversing through challenging stages. 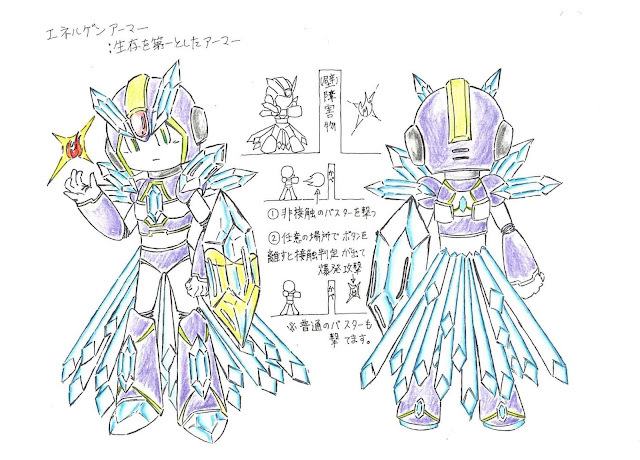 As the winner of the contests, the Energen Armor has been redrawn by Yoshihiro Iwamoto. 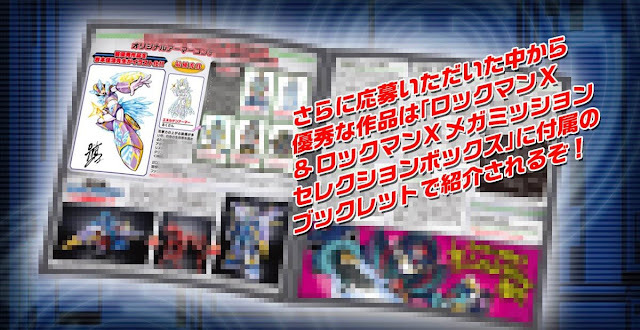 The illustration will debut in the booklet for the upcoming Carddass and Mega Missions box set. You can see a tiny sample of that above. A smartphone wallpaper of Iwamoto's illustration will be distributed to participants close to the box set's release. 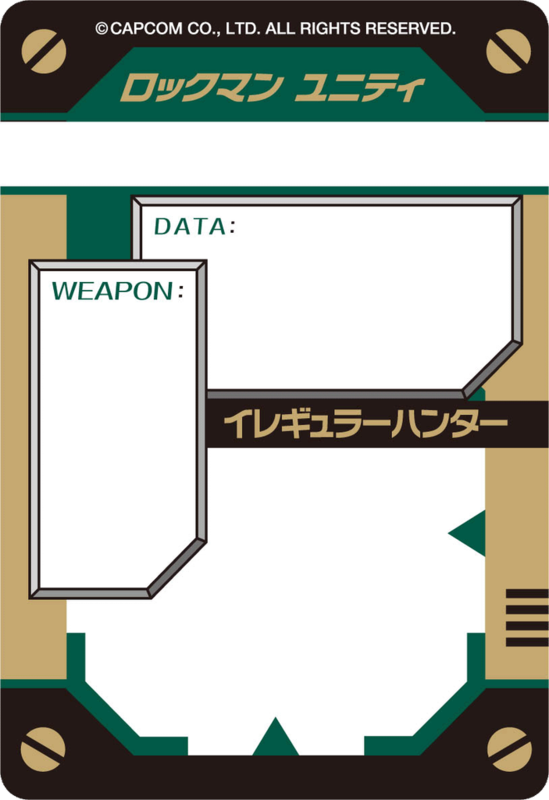 For everyone else who didn't win, Rockman Unity have whipped a pair of Carddass trading card templates. The front side is for the armor/character and the back side is for the bio and stats. 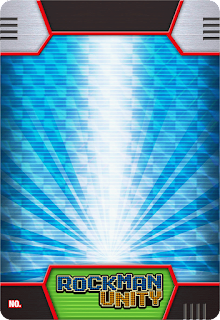 Use 'em to make your own cards! At least the winner wasn't some re-edited armor like the last post. I mean, c'mon, those designs where redesigns of old armors. Your not wrong man. My reaction was like : ...Damn. Tail feathers are a little much, but not bad. So, protodude, who won the mega mix? I look forward to seeing the official card for the new Maverick which I can only assume to be named, "Glassing Drogoio." Wow, compared to the other ones shown in the last post I saw this is just plain generic. The entry itself doesn't look amazing, and the armor abilities are pretty subtle and similar to the Gaia Armor on paper, but the idea of it being a throwback to a stage from X2 is frankly amazing. This looks like someone took Gate's design, removed rhyme and reason from it, cluttered it with crystals, and called it a day. Sounds like a handy armor. Crystal Snail would be proud. Looks cool. It wasn't my personal favorite but it's still a neat design regardless. It sounds a lot like the Gaia Armor though. I was hoping Wizard Armor would win, it looked like it would fit in with the other X armors and had a similar color scheme. Not sure if I'm more underwhelmed or disappointed. This design really doesn't fit the aesthetic of the series, it feels like something you'd see in a magic-fiction series. At least the official art of the armor looks cool, it's just a shame that we won't be seeing any of the others.